Please come out on Friday, November 16th and Saturday, November 17th and support the South Williamsport Fire Department at the 2018 Turkey Fair! Tickets are only $1.00 per ticket and there will be free refreshments and entertainment. Hope to see you there! Congratulations Deputy Chief Daniel Smith & Family! On 9/19/18 at 05:47 Carolyn Smith, daughter of Deputy Chief Daniel Smith and Member Chloe Smith, was born weighing 7 lbs 13 oz and measuring 20.5 inches. Everyone is happy and healthy! From the members at Station 5, congratulations Smith family! Please join the South Williamsport Fire Department on Saturday October 6th, 2018 at 573 Hastings Street South Williamsport, PA for a day of fun filled Games, Fire Prevention Activities, and Food. The community day lasts from 1:00 pm through 7:00 pm. Hope to see you there! 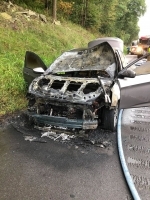 Engine 5 handled a car fire on Route 15 this morning. This evening Rescue 5 responded to this 3rd alarm fire in Williamsport. At 00:24 hours Engine 5 was dispatched to assist Station 15 on a house fire. The Engine responded with a crew of 6 and assisted with overhaul operations. 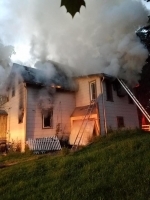 This evening the Rescue responded on this 2nd alarm fire in Williamsport. The South Williamsport Fire Department is always trying to recruit new members for the company. Associate Members play a key part in the success of our organization. Associate members do not actively respond on emergency incidents and are not required to receive any training in emergency services. Associate members assist with the administrative and fundraising efforts of the organization. Associate members serve on various committees and assist with fundraising events that help raise much needed funds towards equipment purchases, station improvements and ultimately to improve the mission of the organization to protect life and property for all citizens served by the South Williamsport Fire Department. If you want to be part of an organization that values it's membership and contribute to your community please contact us today at recruitment@southfire.org or (570) 326-4167! Also, check the files page to download an application today! This site has been viewed 56,888 times.